Newsflare is supporting new London based charity Crowd Fuelled Causes in raising money for vulnerable women around the City. The guys at Crowd Fuelled have been drawing attention to their cause this week by starting a queue outside the Apple store on Regent Street, over a week before the UK release of iPhone 5. The volunteers will then sell their seats on Friday 21 September to raise money for their charity enterprise, the Hope Boutique Bakery, which will employ, train and develop some of the female victims of domestic abuse from around London. So to help the guys with their cause, Newsflare are giving 100% of the proceeds of Crowd Fuelled Causes videos to the charity whilst helping broadcast their efforts! The volunteers at Crowd Fuelled Causes are helping women on a first hand basis by setting up the Hope Boutique Bakery, and continue to think outside the box to come up with the most effective charity events. Be sure to check out their videos from the queue this week and support this fantastic cause. 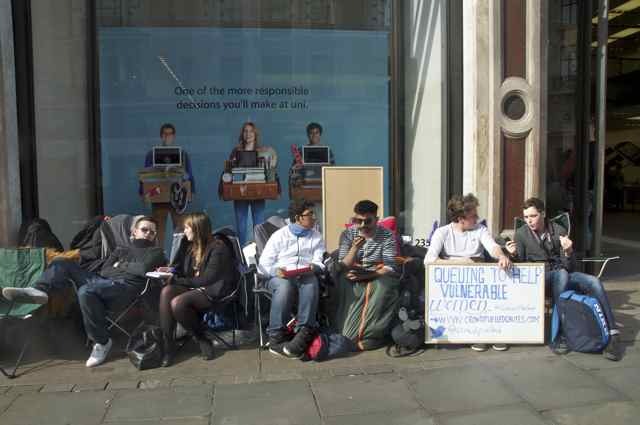 Take a look at Crowd Fuelled Causes profile on Newsflare, or click here to bid for a place in the iPhone 5 queue, and be one of the first in the UK to own the new handset!